Mirror in high quality, inclusive mounting clamp. delivery inclusive arched plate glass for the best rear view. Wiper arm as a single part fit to the Multicar type M24 and M25. Wiper blade kit (two pieces) fit to the Multicar type M24 and M25. New reproduction in best quality. 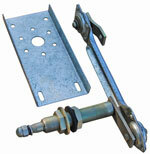 Wiper linkage fit to the Multicar type M25.